1. So, to be honest, I wasn't sure how many folks were gonna make it through the 50 States ride. 62 miles is not that far. But sitting on a bike for 6 or 7 hours is something your body has to get used to. SO we'll make 62 miles our 2019 goal. And in 6 weeks we'll try a more manageable challenge. 2. And yes, "challenge" means some people won't make it. Just keeping it real. But that's the fun of cycling, chewing off too much and then figuring out how to do it. 3. 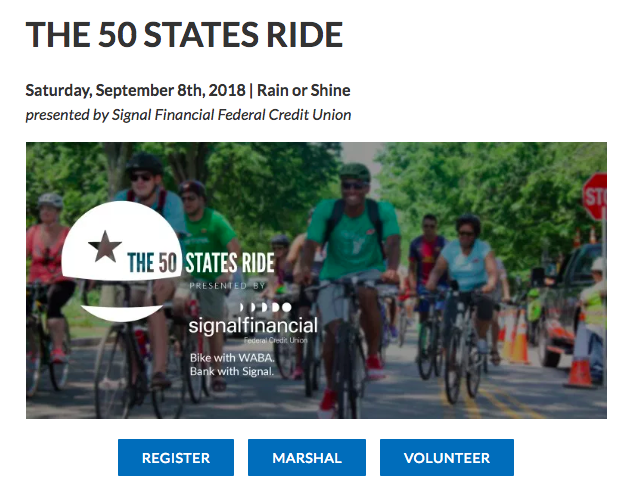 WABA (Washington Area Bicyclist Association) announced a ride that is halfway between the 50 states and the 13 Colonies ride (15 miles). It's called Route 66. This year, in honor of the 15th the 50 States Ride, we have developed a third route: Route 66: This new route tours the eight streets named for states that the original US Route 66 passed through. You’ll ride these states in geographical order, east to west, without riding on any other state streets in the District. At 35 miles long, Route 66 is a middle distance option between the two classic routes. Don’t worry, there are still plenty of hills. Welcome to the new American road trip! 4. I'm going to marshal our group. I am hoping to loop in another instructor (Dave? Rana?) to also marshal. This way we'll have a leader and a sweeper. 5. 35 miles is basically spin class times 3. It's 6 week's away. Who's with me? 7. Consider taking a City Cycling class with WABA. It looks like they will resume in August. 8. Once you register, please send me an email dru cycles [at] gee mail to confirm and I'll add you to the email distribution for outdoor rides. We'll have 6 outdoor rides. 3 for all abilities (15-30 miles) and three 40+, hilly rides. I'm looking to hire a bike mechanic for the shorter rides. We'll discuss that on email. 9. These rides are NOT affiliated with any indoor classes I teach. I want to help folks get outside and ride. Remember, The Prestige (see trailer) ... no winning in the gym. Winning happens outside in the real world.